Uppercase "E" stands for "exponent" in calculator displays. 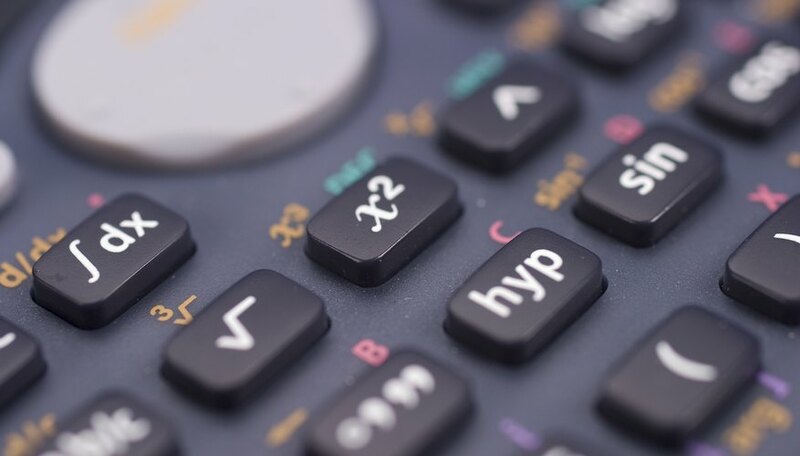 Calculator manufacturers use it to display numbers in scientific notation because the longhand version is difficult to display and would be even more difficult to read. To complicate matters, some calculator manufacturers use lowercase "e" to denote exponents, inviting confusion between scientific notation and Euler's number, which is a different thing altogether. Don't be taken in. If either an uppercase or lowercase letter "e" appears on your display, it denotes an exponent. The only place you'll see Euler's number is on the keypad. On a calculator display, E (or e) stands for exponent of 10, and it's always followed by another number, which is the value of the exponent. For example, a calculator would show the number 25 trillion as either 2.5E13 or 2.5e13. In other words, E (or e) is a short form for scientific notation. Science is full of very large and very small numbers that are difficult to read and write. For example, the mass of the earth is 5,970,000,000,000,000,000,000,000 kilograms, while the mass of a hydrogen atom is 0.00000000000000000000000000167 kilograms. Scientific notation makes these numbers easier to handle by expressing the 0's as a power of ten. Using this notation, the mass of the Earth becomes 5.97 × 1024 kg, and the mass of a hydrogen atom becomes 1.67 × 10-27 kg. Instead of numbers with long strings of zeros that are difficult to count and even more difficult to display on a small screen, you have more manageable decimal fractions and exponents of 10. In its written form, scientific notation would look strange on a calculator. It would be confusing and it wouldn't fit on a small display. To avoid these problems, manufacturers created a symbol for "X 10." This symbol is either E or e, depending on the calculator. This letter is always followed by a number, which is the exponent to which 10 is raised. On a calculator display, the mass of the earth would be shown as 5.97E24 (or 5.97e24). The number 5.97 is the argument and the number 24 is the exponent. Similarly, the mass of a hydrogen atom would be 1.67E-27 (or 1.67e-27). It's just as difficult to punch in long strings of zeroes on a calculator pad as it is to write them on paper, so must calculators have a shortcut. It's the EE key. To enter a number in scientific notation, first input the argument, then press the EE key and enter the exponent. For example, to enter the mass of the earth, key in 5.97, then press the EE key and enter 24. The display will read 5.97E24 (or 5.97e24). Note that the number will appear with all its zeroes if they fit on the screen. For example, if you key in 1.2 EE 5, the display will show 120,000. Most scientific calculators devote a special key to Euler's number, because it is one of the most important irrational numbers in mathematics and enters into all kinds of scientific calculations. This is the "e" key. Press it, and Euler's number will appear in your display to the accuracy the display allows. The scientific calculator on an iPhone, for example, shows 2.718281828459045. In addition, most calculators also have an "ex" key. Enter a number, press this key and the display will show the value of e raised to the exponent you entered. In neither of these cases does "e" have the same meaning as it does when it appears in the display. Deziel, Chris. "What Does an E at the End of a Number Mean?" Sciencing, https://sciencing.com/end-number-mean-7430704.html. 10 April 2018.